Not going to lie to you. I was excited to wear this today. This top is from ASOS and is by the brand Sister Jane. I love the classic collar, the light fabric (the finest polyester I am sure) and of course, the diamante detailing. They define this as "pink" on the site....oooookay then....it's obviously the palest pink AKA cream but in ASOS's defence, the website pictures are very true to how it looks in real life so there were no nasty surprises upon its arrival. I really love it and it has got me looking at the brand's other offerings which all embody the same sentiment as this top - retro shapes and modern styling. A perfect combination! Shoes: Were the ole' grey Kurt Geigers. Earrings: not sure of the brand but they are Akoya pearls? This is THE candle that is rocking my world at the moment - by the suppliers to Bath & Body Works, Slatkin & Co, it's good old Vanilla Caramel. In some ways this is the most generic of scents - it's just a sweet vanilla that is duplicated by countless other candle companies. But the way this penetrates your home cannot be mistaken. It's strong and sweet and will make you crave dessert. I have a few candles from this brand and for the purposes of making your home smell delish (and for hiding kitchen cooking smells and my intense need to put garlic into everything I cook) this is one of the best. the blouse looks so pretty!! 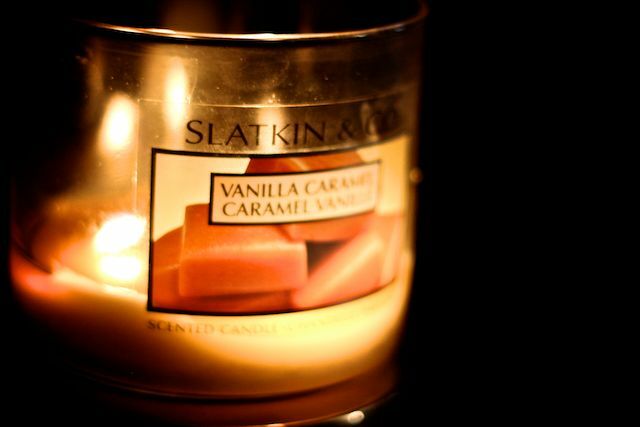 and I love vanilla and caramel bet the candle smells so nice!!! 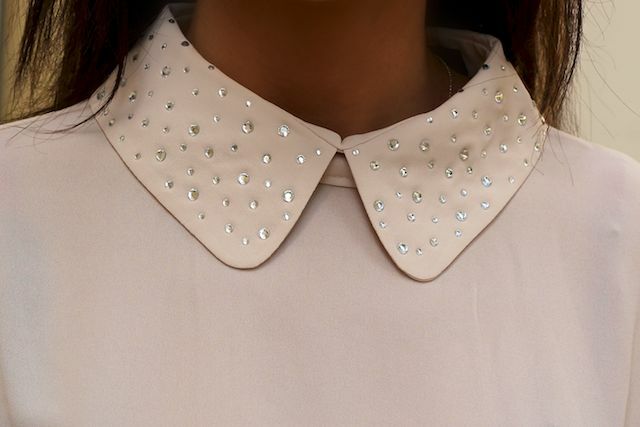 I love the diamonte detailing on the collar - so pretty! As for candles it has to be some kind of Christmas spice for me at this time of year! @Victoria - enjoy! i also recommend Smores and Fireside! @Sorcha - i love anything cinnamon - to me that's v. xmasy...although even thinknig about xmas has me scared! The top is lovely, I like the colour and its simple detailing! I also must purchase some cheap monday skinny jeans, I find it so hard to find some decent ones which don't lose shape and leave baggy knees! @Robyn - to be completely honest I wouldn't buy these ones...they grey cheap monday jeans that I have are much better quality. these are pretty meh...i might look at H&M soon and see what they have to offer as a lot of people recommend their jeans. its so tricky! the blazer is VERY flattering. I read that you didnt recommend those cheap monday jeans. I feel you have to dry on so many of the same cut till you find a pair that is of higher quality, and they all seem to be made and cut a little differently EVEN if they theyre the same size and style. that blouse is sooo cute, love it! When I first saw the pic of just the collar I wasn't sure I liked it, but the way you paired it with that blazer looks so good! @missarch - ooh i love the sound of your outfit! @nana - i know! it's such a bloody process! i love my grey cheap monday jeans and these are nice but nothing I would rave about. the hunt continues! @Rachhh - i do too! i was told that earlier this year by a regional manager who was working in a store in dubai. major fingers crossed! @E V E L Y N - thats my favourite bit too :) as soon as I saw it on the website i felt that it spoke to me. @meowie - not yet but I really really must! I love anything mint! thanks for the recommendation. @modniza - thanks girl :) its quite a thick material so perfect for winter too! The shirt is so so pretty! and ohh i didnt know b&bw was opening in the UK, so excited now! Oh my gosh. I'm in love with that top. I'm instantly drawn to anything rhinestone/glittery/shiny. Again, amazing. Your simpler outfits rock my world! the blouse is spot on! Laura, Ur face is glowing. Do you still use Clarisonic? Gorgeous, love how feminine it is, I loves me a soft pink/cream!! That collar is just beautiful. It's such a simple top, but it's so classic. You wear everything so perfectly. :) Beautiful blouse. The collar is such an amazing detail. Very feminine! wow that top detail is stunning! very girly! OMG. Love those candles. I actually combine something sweet like the vanilla caramel with Fireside, and it puts me in the perfect winter mood! Very helpful when you live somewhere where 50 F is considered frigid. Ah ! I love love love love the top. It's absolutely gorgeous. ! I got my first pair of Cheap Monday jeans a week ago and I blame you Laura! Seriously the best denim I have had so far. Suffice to say that my Diesel and Acne have gone to the back of the wardrobe. That and I love to shop in Urban Outfitters in Covent Garden, you're pretty much guaranteed to find cool stuff there every time you go.